In this insightful and provocative volume, Rameyreveals spirituals and slave songs to be a crucial element in American literature. 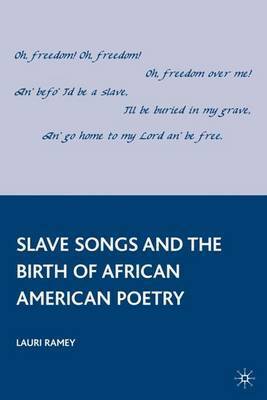 This book shows slave songs'intrinsic value as lyric poetry, sheds light on their roots and originality, anddraws new conclusions on anart form long considereda touchstone of cultural imagination. LAURI RAMEY is Director of the Center for Contemporary Poetry and Poetics, and is Professor of African American Literature and Culture and Creative Writing, at California State University, Los Angeles, USA.